A big-hearted ruckman/forward, Cloke had an enormously impressive League career over almost two decades. He started his League career with Richmond after playing VFA fourths football with Oakleigh. He starred as a centre half-forward early in his career, but also had spells in the ruck or in a forward pocket, where his strong marking was a great asset. He played in the 1974 and 1980 Tiger premiership sides and was Richmond captain in 1982. However, Collingwood and Richmond at that time were locked in a poaching war and Cloke was lured to Victoria Park and appointed vice-captain. Cloke, a regular Victorian representative, gave the Magpies superb service in the ruck and was vice-captain from 1983-87. 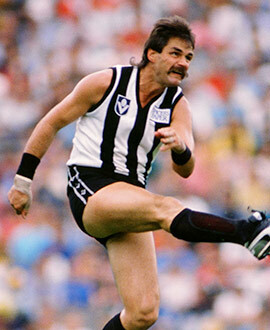 However, he struggled to get a game late in his career with the Magpies and was released back to Richmond in 1990 and he gave the Tigers two excellent seasons in the twilight of a great career. Cloke was appointed captain-coach of ACT club Ainslie for the 1992 season and his sons, Jason, Cameron and Travis, all went on to play for the club in the 2000s.